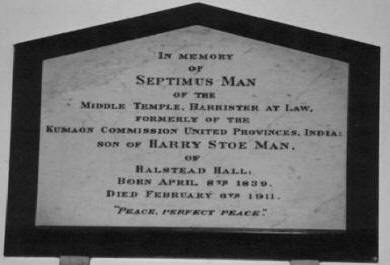 Septimus Man was born on 8 April 1839 at Halstead Hall, Halstead, Kent, the son of Harry Stoe and Louisa Caroline (Fowle) Man and baptized on 5 May at St. Margaret’s Church, Halstead, Kent. He died on 6 February 1911 in Hythe, Kent and his ashes were interred in St Margaret’s, Halstead. Septimus belongs to Man Generation Eight. See also Hubert Man’s, Morrice Man’s, and E. Nesbit’s recollections of Septimus Man below. 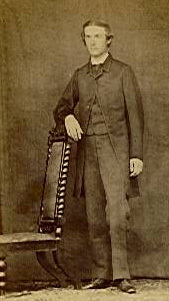 A page from The Jurist has been found on the Internet indicating that Septimus was called to the bar (Middle Temple) in June 1867. These are Hubert Man’s recollections of his uncle Septimus Man: Born at Halstead on April 8th, 1839. Sponsors, Major Walsh etc. He was educated at the Naval School. He went out to India in the telegraphs but obtained an Assistant Magistracy at Kumon [Kumaun / Kumaon]. He got bad sunstroke and came home, had brain fever, he was laid out for dead in the old fashioned way at Halstead, with a penny on each eye and a plate of salt on his chest. His coffin was in the house. allowance from his family. There were many stories of his eccentric doings. He walked about Paris in an Admiral’s uniform and subsequently told his brother Edward that he was charmed by the politeness and consideration shown him by the French. On one occasion his brother William went to visit him at his room in London and tried to persuade him to have a bath. Sep agreed with the proviso that Bill had one first. As soon as Bill was in the bath Sep threw his brother’s trousers out of the window and dashed out into the street. Uncle Bill always declared that in his anger he leapt from the bath and armed only with the sponge pursued Sep into the street. Septimus was very musical and fond of children. I remember him well; he used to play the banjo for us and always asked whether we were fond of roly-poly pudding. His mother always said of him, that in his young days he was the cleverest and best of all her sons. He lived to be over 70. The Man family left ‘Halstead Hall’ toward the end of the nineteenth century. 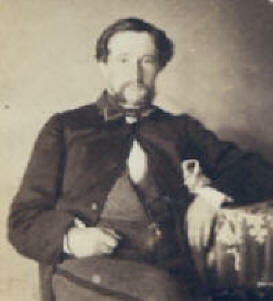 Louisa Caroline Man died in 1878 while living with her daughter Eleanor at Carshalton. Afterwards, the family rented the ‘Hall’ out to a number of families among them that of the author E. Nesbit. It was an uneventful, peaceful, pleasant time. The only really exciting thing was the presence, within a stone’s throw of our house [the ‘Hall’], of our landlady’s son [Septimus Man] who lived all alone in a little cottage standing in the fields. He was reported mad by the world, eccentric by his friends, but as we found him, perfectly harmless. His one delusion, as far as I know, was that he was the rightful owner, nay more the rightful tenant of our house, and about once in six months he used to terrify the whole household by appearing with a carpet bag at the front door and announcing that he had come to take possession. This used to alarm all of us very much, because if a gentleman if eccentric enough to wish to ‘take possession’ of another person’s house there is no knowing what he may be eccentric enough to do next. But he was always persuaded to go away peaceably, and I don’t think we need to have been so frightened. Once while he was in the drawing-room being persuaded by my mother, I peeped into the carpet bag he had left in the hall. It contained three empty bottles that had held mixed pickles, a loaf of bread and a barrister’s wig and gown. Poor gentleman. I am afraid he was very eccentric indeed. “The Hall, it was called, but the house itself did not lend itself to the pretensions of it’s name. A long, low, red-brick house, that might have been commonplace but for the roses and ivy that clung to the front of it, and the rich heavy jasmine that covered the side. There was a smooth lawn with chestnut trees round it, and a big garden that ran round three sides of a pond with the fourth side accessible to the rest of the villagers. In the garden flowers and fruit and vegetables grew together, as they should, without jealousy or class-distinction. There never was such peonies as grew among our currant-bushes, nor such apricots as hung among the leaves on the sunny south wall. From a laburnum tree in the corner of the lawn we children slung an improvised hammock, and there I used to read and dream and watch the swaying green gold leaf and blossom”. This house was to be remembered by Edith as the favorite of all her childhood homes and she spent three very happy years there in a period of security and consolidation. Although Edith’s childhood was virtually over, at the age of fourteen, there were still many pleasant interludes and adventures to be had, especially when Alfred and Harry came home for the holidays. The boys built a raft for the pond (“Which was but a dull thing when the boys were away at school”). They had also discovered a marvelous secret hiding place, which could only be reached by climbing up through a hatch in Edith’s bedroom ceiling into the roof space and then traversing a narrow passageway which runs all around the house between the ceiling and the eaves. 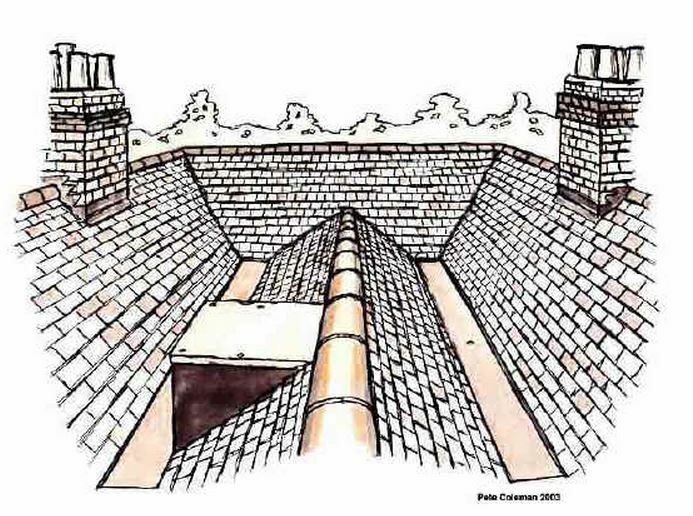 They could eventually emerge by means of a narrow door, out on to the flat centre of the roof surrounded by four tiled ridges. “This until the higher powers discovered it, was a safer haven (for privacy) than even the shrubbery. Happy vanished days, when to be on the roof and to eat tinned pineapple in secret constituted happiness. There was one more diversion for Edith and her brothers, if they ran down the field at the back of the house, they would come to a railway line that ran in a deep cutting with a distant tunnel in either direction.